Why buy a manufactured gift while you can craft something that express your love and affection? 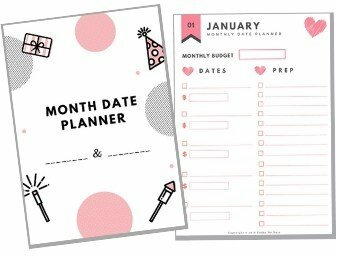 While Valentine’s Day is approaching, us girls are scratching our heads for the best gift ideas for boyfriend, hubby or your loved ones. We get it. There are just too many gift ideas out there that keep us scrolling on, and on, and on, until the last minute. So we’ve got you covered. These DIY Valentine’s Day projects are easy to make and beginner-friendly. If your Significant Other loves sentimental gifts, these homemade crafts are surefire to impress. Valentine’s Day is all about letting your loved ones know how important they are. With this little DIY love box, you can bring them back to the sweet moments you’ve spent together. Let them know that you’ve never forget. 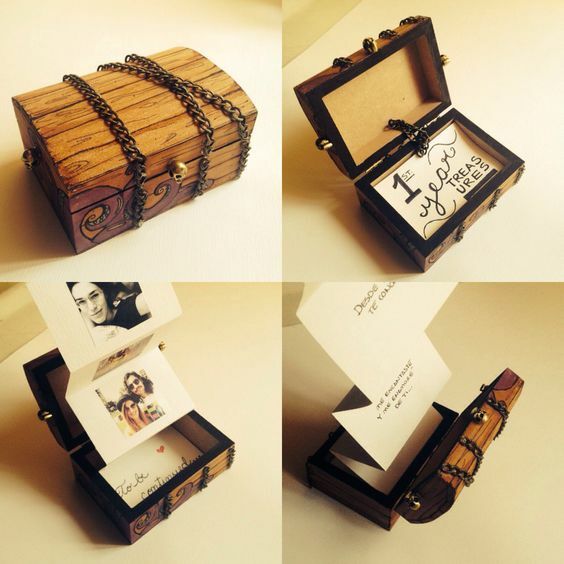 If you master making a photo box, why not add some playfulness to it by putting the album in a locked treasure box? Anyone who gets it will enjoy the sense of achievement after the romantic “treasure hunt”. We all at some point wish to make gift-giving an epic experience, right? That’s probably why explosion boxes are such a thing right now. Just when you think it’s another ordinary gift box, the cards filled with sweet memories pop out, making it impossible to forget. Ready to make your own? To make things easier, Erica from Shari’s Berries has created free printable explosion box templates with a detailed guide. Check it out and you’ll be thrilled how easy it can be. 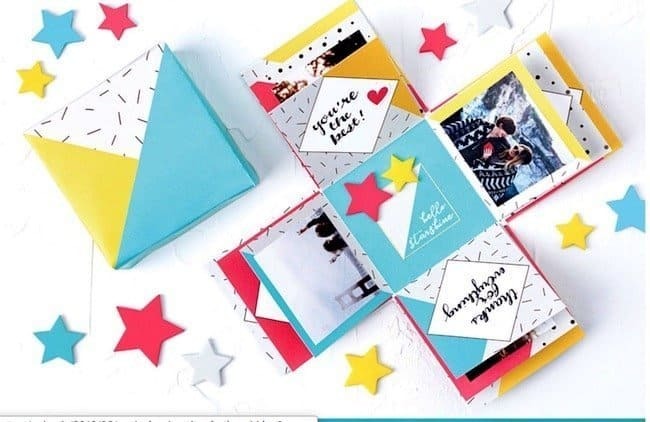 This DIY camera photo book is another creative way to present your unforgettable moments together. It may take some time to make the perfect camera with paper. But crafting a keepsake gift like this will worth every minute spent. This cute folding photo cube is the kind of gifts that are easier to make than it looks. Every time you flip and fold, you’ll find something new. Let’s see how fast your SO solves this cube riddle! 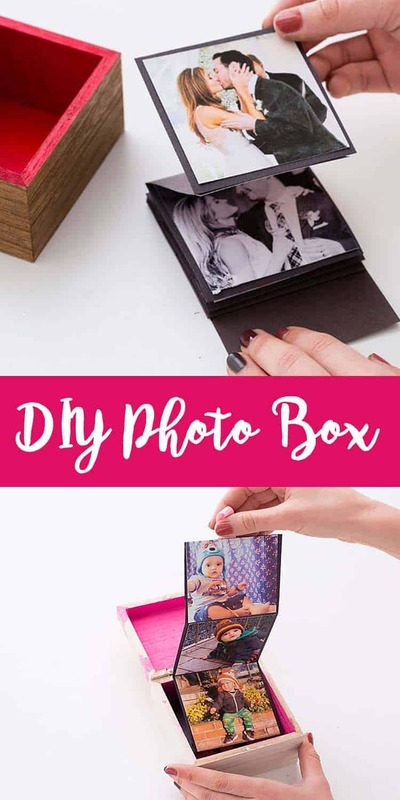 All you need is 8 wooden cubes, the photos to print out, glue, cutter and some washi tape. “Hug this pillow when you can’t hug me.” A DIY pillow as a gift for your valentine is both sentimental and practical. 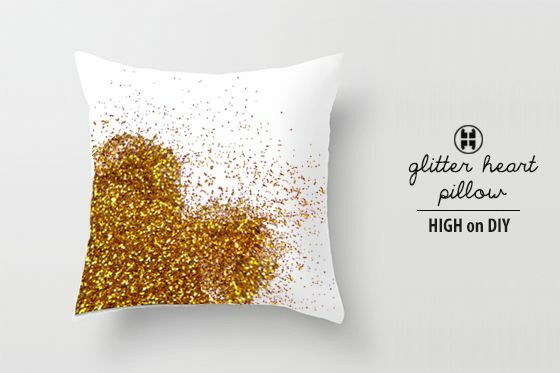 He’ll not be able to take his eyes off this glitter heart pillow fabricated with love. 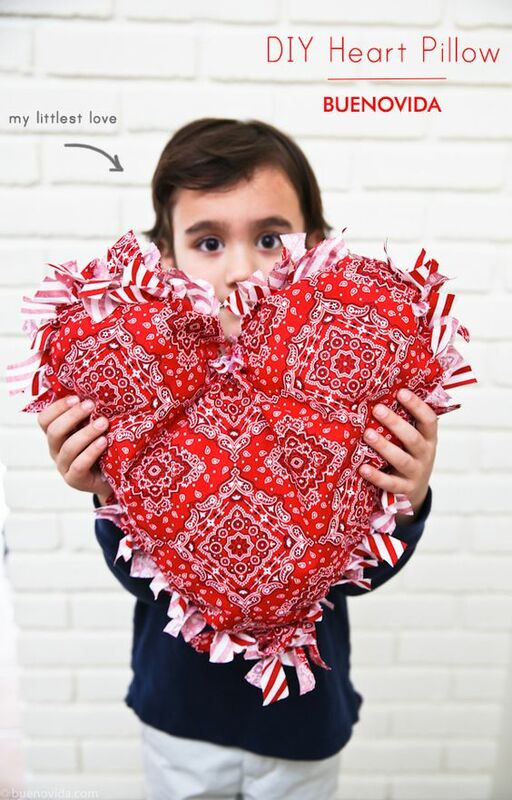 Looking for Valentine’s Day DIY projects for kids? This heart pillow will get your little ones engaged in a fun, “hands-on” experience. It’s also a perfect gift for moms, your friends and any homemaker. Do you have a friend or a special someone that just can’t live without gaming? 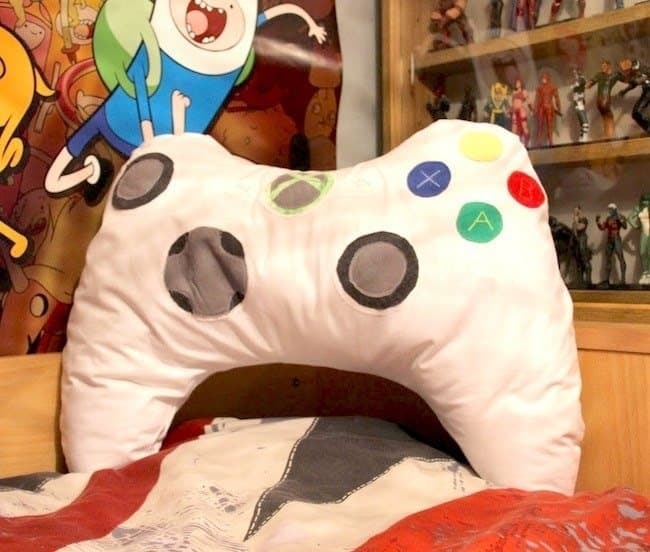 Well, if so, why not wow him with a unique controller pillow that he couldn’t get anywhere else? Matchboxes are a little hard to find these days, right? But if you can get your hands on them, making an advent calendar like this should be a piece of cake. Inside each matchbox, put in a special date idea or a love coupon to spoil him. This is the best part of an experience gift. The joy of getting a present last for days and weeks and it doesn’t need to be expensive at all. Not just us girls love getting flowers on Valentine’s Day. Even the boyfriend who hates cheesy stuff will love getting a handmade paper flower like this. Feel free to replace the corny “I love you” message in the flower with an inside joke. It will definitely put a smile on his face. What a decor piece to impress! 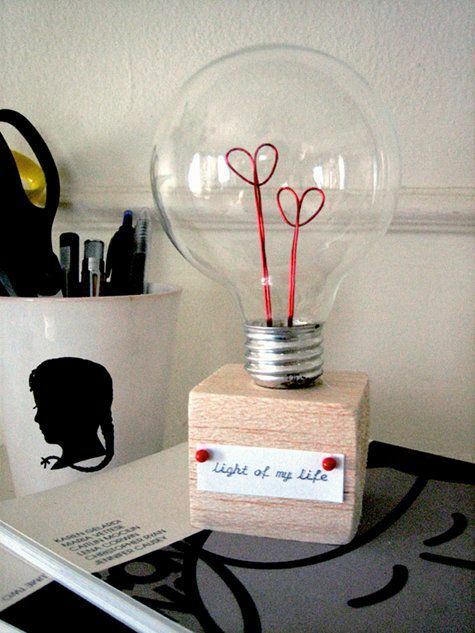 This cute “light-me-up” bulb is a non-verbal way of expressing gratitude to your special someone. And it proves that the most meaning gifts don’t have to be pricey at all. Home states are always something close to hearts. If your long distance boyfriend or hubby can’t come home for Valentine’s Day or birthdays, why not bring home to him? 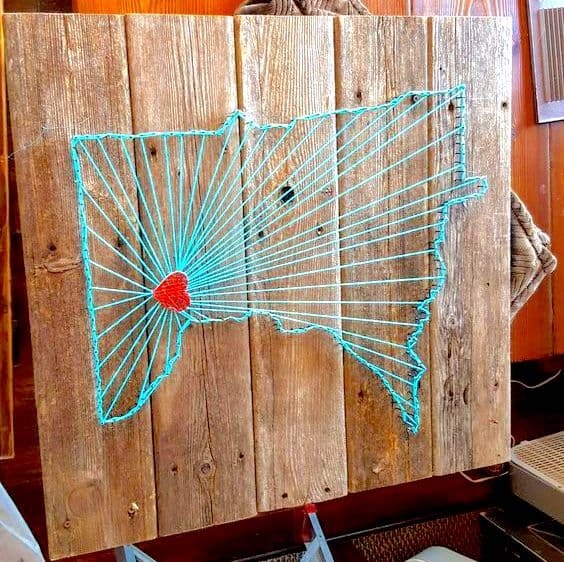 The original version shown down below is a pretty big wooden string wall art in shape of Minnesota. But if you want something to put in an LDR care package, you can change the shape and scale it down to your liking. Can you imagine the feelings getting a wall art of your own profile? Check out this tutorial from Lowe’s and be prepared to craft a keepsake gift for your loved ones! The best Valentine’s Day gift doesn’t have to be anything physical. Sometimes a perfect date night out or a romantic at-home dinner can be more memorable than a store-bought gift. Tricks to make an at-home dinner date more romantic? Making a floral ice centerpiece is definitely one of them. Check out the step-by-step tutorial on FTD and be inspired with even more ice bucket decor ideas! Alright, that’s it for the DIY Valentine’s Day gift ideas. But have we missed something? Tell us about how you plan to surprise your SO this year in the comment! Happy dating!